HOLIDAY WORLD 2006 EXPANSION PLANS ANNOUNCED! Just a short while ago, Holiday World & Splashin' Safari in Santa Claus, Indiana, made a major announcement concerning their plans for the 2006 season and, WOW, what an announcement it was! Holiday World will be adding a new area of the park in '06. It will be the Thanksgiving section. The new Thanksgiving section will feature a huge new wooden roller coaster!!! 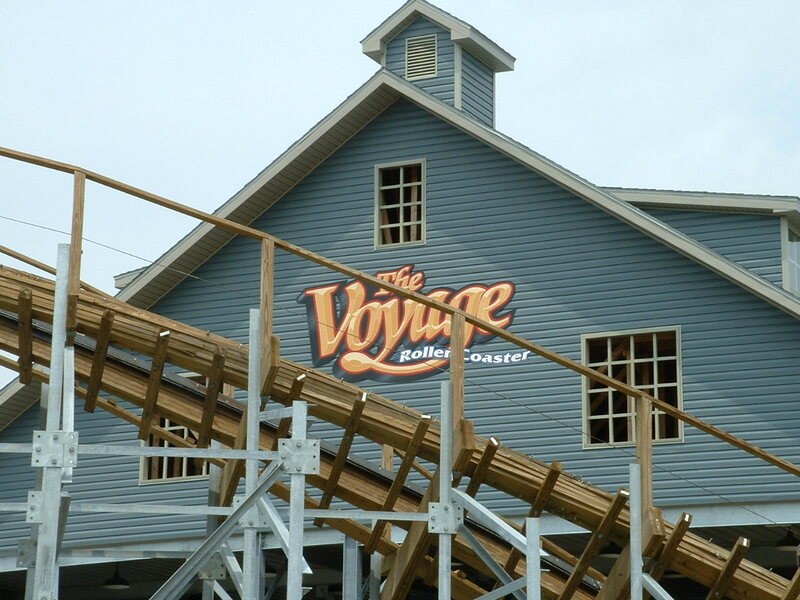 The new coaster will be called The Voyage. It will feature over a mile of track, which will wind in and through the woods, passing through five underground tunnels (a world record!) - and all at speeds of over 67 miles per hour. Overall, the coaster is to be one of the top three longest and fastest wooden roller coasters in the world. The Voyage, at it's tallest point, will be 173' tall. It will have drops of 154', 107', and 100'. The ride time will be approximately 2 minutes and 45 seconds. Also important to note: The track will feature two 90° extreme banked turns. The first drop will feature a US world record 66° angle of decent. It sounds like it will be quite a roller coaster, and we applaud Holiday World on this exciting new addition! Holiday World also promises that the new Thanksgiving section will be stuffed full of new and thrilling family fun, including a turkey-chase-themed interactive "dark ride," another new ride, a large restaurant, gift shop, games and more. On the Splashin' Safari side of the park, Bahari River will be added (a huge new action river ride). Please visit Holiday World & Splashin' Safari's web page, http://www.holidayworld.com/new2006.html, to check out several graphics depicting The Voyage roller coaster. You can also take a virtual ride on The Voyage. Holiday World & Splashin' Safari are planning to have The Voyage and the new Thanksgiving section and attractions open for everyone to enjoy on their May 6th, 2006 opening date. The year 2006 also marks Holiday World & Splashin' Safari's 60th anniversary! American Coaster Enthusiasts and the Midwest Region send congratulations to Holiday World & Splashin' Safari on these wonderful announcements! 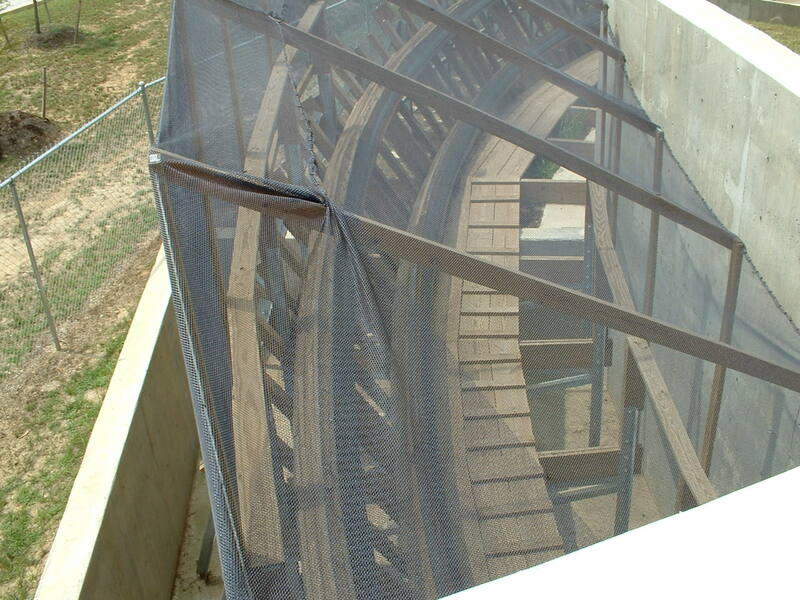 We anxiously look forward to the addition to our region's 26th* roller coaster! 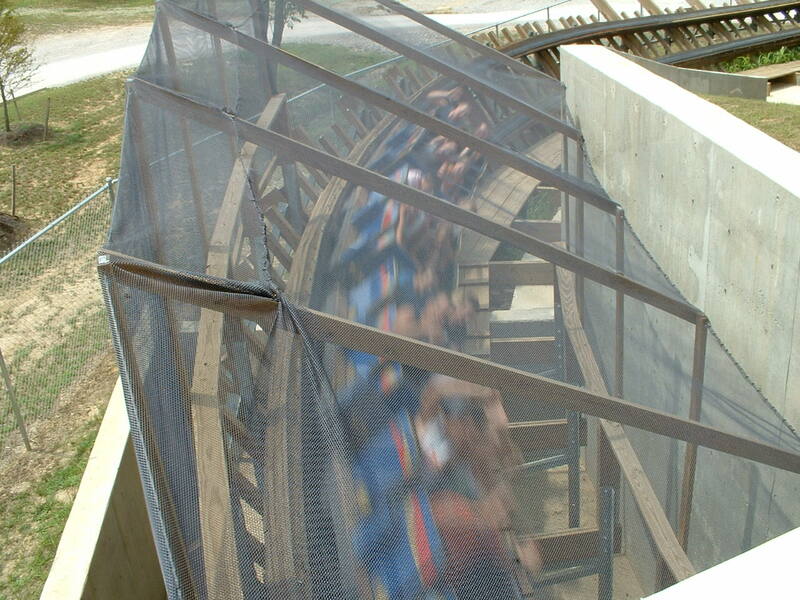 DESCRIPTION: The Voyage, which opens May 6, 2006, is Holiday World's third wooden roller coaster. Located in the new Thanksgiving section, it is 1.2 miles long and provides a record 24.2 seconds of "air time." This steel-structure wooden coaster takes a twist on the standard out-and-back layout, adding a terrain-coaster adventure in the "back" half of the ride. FEATURES: The Voyage includes a record five underground tunnels (some are double, creating eight "underground moments"), a series of dramatic drops (including a 66-degree angle of descent on the first drop), two 90-degree banked turns, and multiple track crossovers. The Voyage includes extreme air-time, extreme banking, and extreme speed. 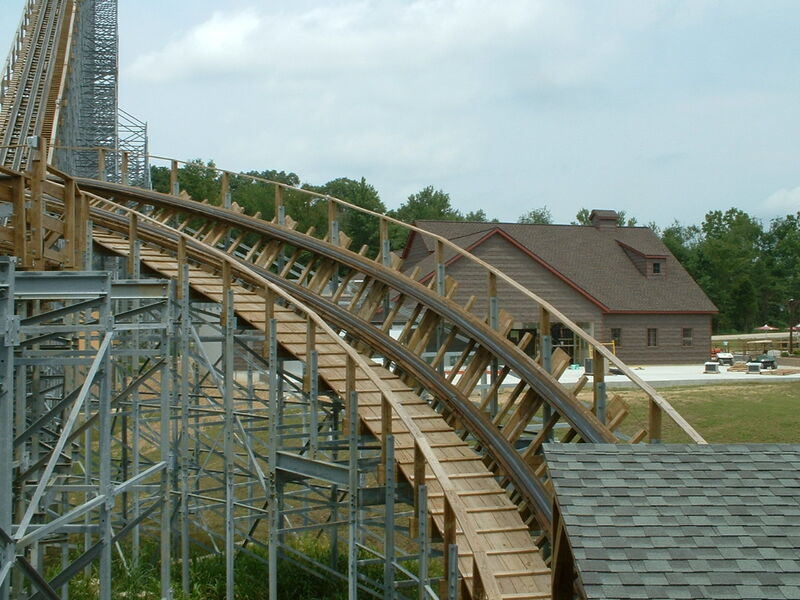 TRACK LENGTH: 6,442 feet (1.2 miles), third longest wooden coaster in the world. RIDE HEIGHT: The maximum height difference on The Voyage is 173 feet. DROPS/ANGLES: The most dramatic drops on The Voyage measure 154 feet (66-degree angle of descent, the steepest drop on a U.S. wooden coaster), 107 feet (51-degree angle), and 100 feet (50.5-degree angle). 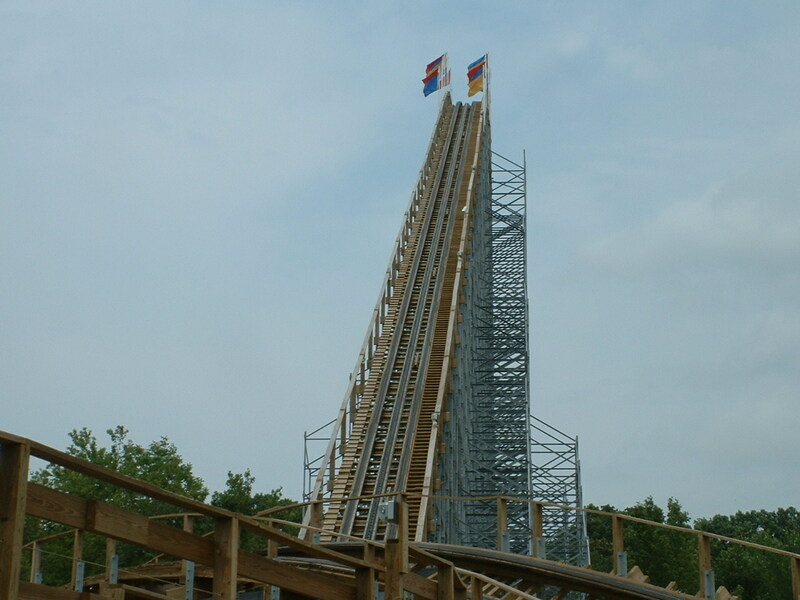 The lift hill measures 163 feet. EXTREME AIR-TIME: The Voyage provides the most air-time of any wooden coaster: 24.2 seconds (anything less than +.25 vertical G's, average front/middle/back seats). EXTREME BANKING: The Voyage includes two 90-degree banked turns. SPEED: The Voyage's maximum speed is 67.4 mph. Average speed is 41.9 mph. RIDE TIME: 2 minutes, 45 seconds (station to station). TUNNELS: A record five underground tunnels, including eight "underground moments" and a "triple down" feature in one of the return-run tunnels. TRAINS: Three 28-passenger PTC trains (seven cars per train, four riders per car). LUMBER: Southern Yellow Pine; estimated board feet: 320,000. CAPACITY/HEIGHT LIMIT: 1,200 Guests per hour. Riders must be at least 48 inches tall. INVESTMENT: $6.5 million, the largest ride project in Holiday World's 60-year history. RIDE DESIGNER: The Gravity Group, Cincinnati, Ohio.